With his shiny black coat and athletic 16.1h frame it’s easy to see why Brittanny Grovernor instantly fell in love with Cherokee Warrior, but the friendly young stablehand had to work a lot harder for reciprocal affection. When Cherokee Warrior arrived at the Joseph and Jones Racing stables where Brittanny worked he was shy, timid and didn’t want a bar of anyone. Every morning Brittanny would drop hay at Cherokee Warrior’s door and watch from a distance as he gobbled it up. Each day she would take a step closer until eventually she could stand in his box. She would talk softly to him and often just sit with him after hours on her mission to earn his trust. Cherokee Warrior in action at the races. Credit: Bradley Photos. Over time Cherokee Warrior let his guard down and Brittanny became his favourite person, the one he looked to for love, care and reassurance. His newfound comfort showed on the track. In his second preparation for Joseph Jones Racing he notched three wins. But after failing to win a race the preparation after, his owners decided to sell him. 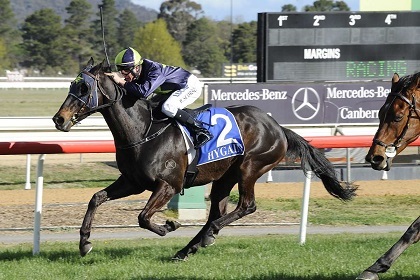 Luckily for Brittanny Cherokee Warrior’s new owners were also local and he was sent to Mick Smith‘s Queanbeyan stable for a change of scenery. A couple of months later Brittanny landed her dream job as Head Girl at Jock Paget Eventing. She kissed Cherokee Warrior goodbye and boarded a plane bound for England. Brittanny returned to Australia in May 2018 and her first stop was Mick Smith’s tie-up stalls to see her favourite horse. It was then Mick asked if Brittanny would be interested in adopting Cherokee Warrior once his racing career was over. She jumped at the chance and started planning for his arrival. Brittanny and Cherokee Warrior share a special bond. On 5thOctober 2018 Cherokee Warrior ran his final race. At big odds he screamed home down the outside to run second, much to the delight of Brittanny and his owners who were there to cheer him on. But when he returned to the mounting yard it was clear something was horribly wrong. He could barely walk, prompting the jockey to jump off and stand him still. On-course vets gave him pain relief and X-rays revealed he had an incomplete fracture of his cannon bone. After three months of box rest at Mick’s place, Brittanny was finally able to take Cherokee Warrior home. She lives in a one bedroom apartment so she has him agisted at Wallaroo with a group of other retired racehorses. Ironically Brittanny had an accident of her own and ruptured her ACL so she won’t be able to ride for at least another six months.